Nature’s unfiltered beer delight – on draught or straight out of the bottle! Brewed similar to classic pale ale, the ZWICKL MAX emerges from the storage cellar barrelled and bottled in its natural unfiltered state. The malt, yeast and hop sediments contained in the unfiltered ZWICKL MAX account for the distinctively palatable and rounded taste. 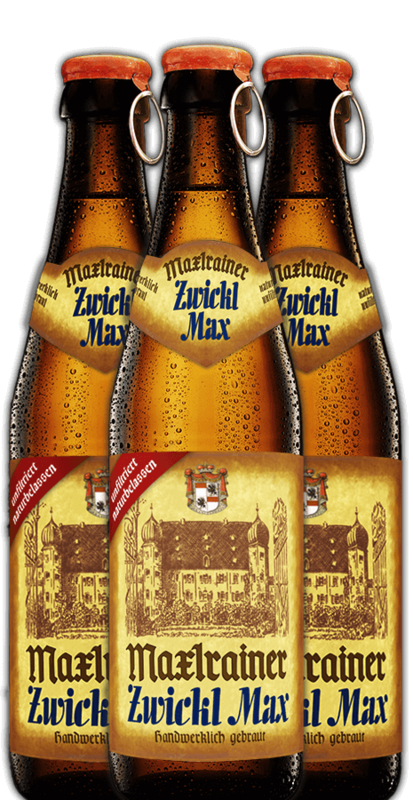 Fitted with a pull-off-cap preferred by young customers, ZWICKL MAX is absolute “Bavarian Beer Bliss” for in-between times and occasions. ZWICKL MAX is yet another variety that has gained the DLG Gold Medal for many years and indisputably ranks among our most popular specialities.